T he Federal Bureau of Investigation lists 200 active shooter incidents between the years 2000 and 2015. It is an unpleasant thought but better to be prepared. Do you have a plan? Does your business? Two experts join American Warrior Radio to share their recommendations and practical tips useful for everyone in today’s environment. Scott Dearduff is a combat veteran, former security specialist and currently serves as the Security Manager for USAA in Phoenix. Sgt. Rob Brandt has been a sworn police officer for more than 20 years and serves in the Tucson Police Department’s Intelligence Division. Both are members of AZ InfraGard, an alliance between the Arizona office of the FBI and individuals committed to protecting our nation’s infrastructure and people. They share practical tips on how you can “harden” your facility. How to maintain a proper situational awareness and developing a plan that hopefully you will never have to use. Seventy percent of Active Shooter situations last 5 minutes or less; far too little time for law enforcement to properly respond. The responsibility to protect yourself, your family and fellow employees is principally your own. 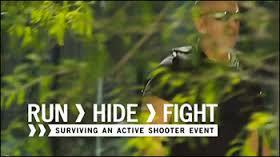 They also expound upon the Run-Hide-Fight strategies that should be employed in an active shooter situation. Basic tips that EVERYONE should recognize like knowing your escape routes, proper barricading procedures and how to employ everyday tools in protecting yourself as a last resort.